When managing large image files in dolphin using the "previews" mode many thumbnail-generating sub-processes are spawned causing excessive memory usage and swap usage (over 2 GB). The computer system essentially "hangs" from the memory usage. Place a handful of large image files (I used 10 tiff files of 45.8 megapixels each) in a folder. Open Dolphin and navigate to the folder containing the image files. Ensure the "Previews" view mode is selected. Ensure the "Right Sidebar" is enabled. Simply hold the cursor over the icon of an image file until it tries to load a preview in the "Right Sidebar"
--A sub-process of kio_thumbnail will be spawned every time the previous step is repeated with a new file to the tune of 202MB each in my case. (2.02GB memory usage in this example from kio_thumbnail processes). The system will begin to slow as the physical memory is exhausted and all system resources are required to facilitate the swapping. Is this an issue with Intrepid or with dolphin-kde4 in Hardy? e are closing this bug report because it lacks the information we need to investigate the problem, as described in the previous comments. Please reopen it if you can give us the missing information, and don't hesitate to submit bug reports in the future. To reopen the bug report you can click on the current status, under the Status column, and change the Status back to "New". Thanks again! I'm having the same problem with latest SVN. kio_thumbnail uses a lot of memory and CPU, and takes a lot of time to free the used memory. This is most definitely still a problem, even in a new Jaunty install. It is particularly pronounced with directories of multipage tiff files. kio_thumbnail processes get launched until all available memory is exhausted, swapping out the entire system until nothing works. Before the system freezes up completely I counted 6 instances of kio_thumbnail at ~200MB each on a 1G memory box. $ ps xo pid,%cpu,%mem,rss,comm,start_time | grep -E " kio_thumbnail| dolphin"
It usually starts by hovering big movie files or folders with big movies files. Though it shouldn't thumbnail them, max previev file size is set to 5 MB (the movies as much bigger than that), the thumbnails button isn't checked. Further more only "Grafik" (I'm 'guessing' the non localized string is "graphics") and Jpeg is selected. And "Använd miniatyribilder inbäddade i filer" (~= "use embedded thumbnails"/"use thumbnails embedded in files"). I've temporarily renamed kio_thumbnail.so to kio_thumnail.so.disabled, since it's a hazard to the system's stabillity right now. A kill-switch for kio_thumbnail, i.e. a "Never generate thumbnails" option, if so only accessible via manually editing ~/.kde4/share/config/kio_thumbnailrc. Or a hard memory limit option there, say 100M (which imo is too much, but at least a limit that should prevent grand-theft-ram). Or better yet, a real fix that makes kio_thumbnail use a reasonable amount or RAM when generating thumbs. Oh, and I'm using KDE 4.3. I was also hit by this bug, twice. In both cases some kio_thumbnail processes suddenly started hogging the memory like crazy, causing massive swap activity. The first time it happened I couldn't do much at all - the system got so unresponsive that I only managed to run 'top' in konsole which, after refreshing a few times, froze completely (even ATL+CTRL+F1 didn't work). I left the computer on for the night thinking it would settle down, but after a few hours the disk was still swapping like crazy and I couldn't do anything. A hard reboot was needed. The only thumbnail-related activity within the last few hours before today's freeze I can recall is copying several large video files from DVDs to hard disk. Although the directory to which I copied the files has thumbnails turned off, Dolphin still shows the thumbnail in tooltip and in the information panel on the right. This might be related, but I have closed all Dolphin windows at least 2 hours before the bug occured, so it might as well be not related at all. I also have a large (22GB) photo collection, but I haven't touched it today at all. I have 4GB RAM + 4GB swap. I run KDE 4.3.1 on Gentoo. I have all thumbnailing plugins enabled (also video via MPlayerThumbs) with max file size set to 5MB. I use Dolphin as the file manager. If you need any additional info, please let me know. If I encounter this bug again, I'll try to provide more useful info. Note the swap usage and the memory usage for kio_thumbnail. Though I do have a Konqueror file manager open with a few tabs, I haven't interacted with it whatsoever since yesterday, and I don't use Dolphin. ...meaning it really was consuming nearly 5G of RAM, and completely unprovoked at that. i frequently have to keep a terminal window open running htop so that i can kill off any runaway kio_thumbnail processes. failure to do so causes the system to freeze, and the disk to thrash. I have 4 gigs of memory, and about 8 gigs of swap space. All easily eaten up by kio_thumbnail. Something similar applies to PDF documents. If you have a directory containing several large PDF documents, and you have preview enabled, konqueror (or dolphin) effectively freezes. Even if you turn preview off, there seems to be no way of disabling a preview component for the right-click properties dialog for PDF files. The same applies with tootips - you get a pdf preview, and that can take a long time. So you have to run without preview and without tooltips, and even then you must take care not to attempt to read the properties of any large PDF. This is an absurd state of affairs. Except for large single image PDF files, the preview image should be the first page, which is unlikely to be very large. It should be possible to get the first page without reading the whole document, which is what seems to be happening. For certain kinds of usage, where you habitually deal with large PDF documents from other sources, this kind of thing is a road block for karmic + KDE4. In fact System Monitor shows konqueror/dolphin eating a large percentage of CPU, so perhaps it's not kio_thumbnail. And at some point konqueror spawns pdftotext. Is there any way to stop this behaviour? This is not related to KUbuntu, but its KDE 4.3.3 problem. If there will be solution, please upstream it! Im currently running x64 gentoo system, based on Calculate linux 10, which is actually prebuilt gentoo. Machine is dual-core E5300 with 4Gb of ram. Im experiencing SAME issues with kio_thumbnail, slowly eating memory up, even if im NOT browsing (or browsed) any pictures and did not open any miniatures. The effect is so insane, that this machine left for 6 hours for a purpose of backing video up(scratched dvd) has experienced kernel panic, because it run out of memory! (4Gb ram + 4Gb swap). See two small examples in attatchment. This is a very serious bug, it prevents normal work even if system is running stock and untouched. This is a picture of htop, displaying kio_thumbnail eating over 4Gb of ram. I've the same problem. It eats so much ram thart it blocks my compuer completly. It seams to occur always with the same pictures. Maybe there is an error in the pictures. Well, amarok behaves in a similar way in the cover art manipulation. In this case, how does it manage to hang all the resources with a few tiny pictures? With this KDE is a real mess... However, maybe there is some specifics about our, say video cards? Mine is known to be quite hostile to linux. Does any of this bug sufferers have a similar chip? Lucid-RC still has this bug. Looks like kio_thumbnail does not free memory. Maybe it creates some cache in memory and does not clean it? If it's true, where can we tune memory limit for cache? Probably the reason is because developers doesn't use thumbnails or doesn't have big video files. I don't know about KDE 4.4.4 but I'm sure it still happens in trunk. This isn't the only one problem with kio_thumbnail. For example, you can try to start downloading few video files in ktorrent and open the target folder with preview. Or try to browse a remote folder that contains video files, etc. Seems that this component wasn't tested completely enough. I've completely removed mplayerthumbs from my systems and installed kffmpegthumbnailer instead. No more memory problems for me. Plus, kffmpegthumbnailer is really snappy, even on a netbook. > kffmpegthumbnailer is really snappy, even on a netbook. Can't say I do. But at least video clips downloaded "normally" don't cause any problems, the thumbnails are just regenerated regularly during the download. I have this problem too with kde 4.4.5, even thought I have disabled video previews and limited previews to files smaller than 5 MB. It seems to be related to the folder preview, as if I disable folder preview, the problem goes away. To disable video thumbnails run the command "mplayerthumbsconfig" and add all video extensions (avi, mpg, mkv, mp4, etc.) to the "Blacklisted file extensions". Is there any fix yet? 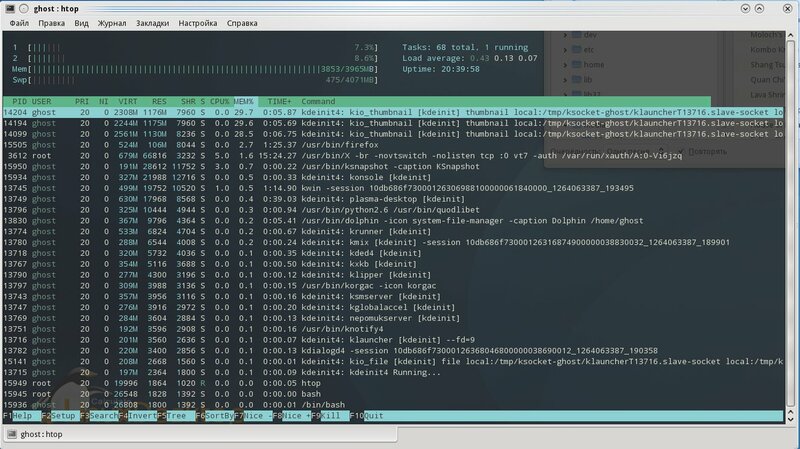 The problem persists in KDE 4.4.5. I'm using Gentoo x86_64. Please unmask and update to KDE 4.5.3 or later! I have tested the case again now in KDE 4.5.3 in Gentoo x86_64 under similar conditions for several hours, this bug was ironed out(resolved). "Kdeinit4: Kiothumbnail" is started once the thumbnail view is requested via Dolphin "thumbnail" button consuming 20-40 MiB of RAM. Thumbnails are displayed rather fast. Then, it idles for around a minute or two and is killed. Hope Kubuntu guys can retest this and confirm. This is still happening on Kubuntu 11.04 with KDE 4.6.4. Opening a folder with lots of tiff files will make kio_thumbnail to use a lot of cpu and the process doesn't come to an end unless it's stopped manually. It's been a few years... does anybody still see this issue with KDE Frameworks 5.44 or greater? Haven't heard anything from the reporter or anyone else who experienced this at some point in the past. Considering it fixed in KDE Frameworks 5. Upstream bug (https://bugs.kde.org/show_bug.cgi?id=185881) has been closed as fixed as of KDE Frameworks 5.